We are one of the distinguished manufacturers and exporters of leather goods/product & accessories along with ladies leather bag & leather apparel. These are appreciated for their alluring patterns, intricate designs and durability. Keeping in mind the requirements of the clients, we have gained expertise in offering Leather Conference Bags, Leather Goods Products, Leather Desktop Set, and Medical Representative Bags. These are designed using quality leather procure from reliable vendors. We also make use of quality animal hides to design the products. Leather being an expensive and tough fabric has managed to grab a secured place in everyones wardrobe. 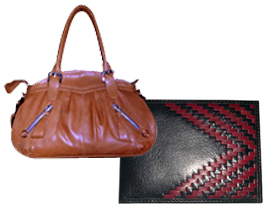 Apart from leather garments, leather accessories are equally popular. Stunning leather accessorie s such as belts, purses, wallets etc are being manufactured in accordance with the latest trends in the national and international market. Leather products are demanded globally which has resulted in a vast range of accessories". Our extensive hard working and talented team with proven record of accomplishment of successful production helps in meeting buyers deliverables and milestones in a timely manner. We constantly train and keep our technicians up to date with standards and technology changes. Our organization team consists of various departments such as marketing, finance, production and administration for smooth and uninterrupted functioning of the company.